If you have ever wanted to record video footage directly from your screen then what you need is a screen recorder – which is primarily what Movavi Screen Capture Studio acts as. Essentially it will let you capture whatever is on your screen, and then save it as a video – but what makes it stand out is both how easy it is to use as well as all the other features that it comes with. Movavi Screen Capture Studio – As one of the most popular screen recorders out there, the reason why Movavi Screen Capture Studio is so widely used is because it is simple and intuitive. Unlike other screen recorders that have a steep learning curve and require a technical familiarity with video capture – you won’t need any of that to use it. In fact, even a complete beginner will be able to figure out how to use Movavi Screen Capture Studio within a few minutes at most. All it will take is a bit of experimentation to familiarize yourself with its features, and understand how they work. Considering how useful it can be to be able to record videos from your screen, it makes sense to have a screen recorder such as Movavi Screen Capture Studio around. Not only could you create video content such as guides and tutorials, but you could also use it to save online streaming videos, record Skype calls, and much more. In a nutshell, if you want to save something from your screen – it will let you do so. Select ‘Record screen’ in the main menu. Click and drag the mouse cursor to draw a frame over the area that you want to record, or use the presets in the list under ‘Capture Area’. Make sure the ‘System Audio’ or ‘Microphone’ icons (or both) are highlighted depending on the audio source that you want to record. Click ‘REC’ to start recording. Click ‘Stop’ when the recording is done. Click ‘Save As’ to save the video. Although that is all that needs to be done to start recording, Movavi Screen Capture Studio will also allow you to control any other recording parameters that you require. With just a few clicks you could set the frame rate, adjust the sound levels, record keystrokes, or make the mouse cursor and ‘click’ sounds more apparent. Additionally, you will be able to control the recording using the hotkeys in Movavi Screen Capture Studio or schedule the recording to start and stop at a specific time. Alternatively, the timer could be used to automatically stop the recording after a certain duration. Having these options should make it a lot more convenient, and will ensure that you don’t have to be present to ‘babysit’ your recording. 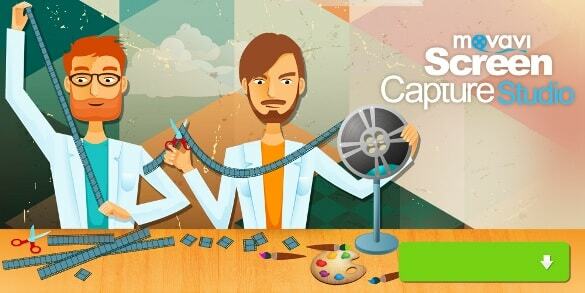 Instead of simply saving the videos that you record with Movavi Screen Capture Studio, you could instead use the built-in editor to improve them further. It can be accessed by clicking the ‘Open in Editor’ button when the recording is done and will give you access to a wide range of features. To start with you may want to process the video footage by trimming out parts you don’t want, merging clips together, arranging the sequence of video segments, improving the video quality, or fixing any issues with it. That should let you create the structure of the video that you require. Once you’re satisfied, you can then use Movavi Screen Capture Studio to polish the video further and give it some flair. There are quite a number of ways to do so, but as a starting point, you may want to add background music, insert captions, apply special effects and filters, or place animated transitions between scenes. With a bit of creativity, you will be able to combine these features to create a unique-looking video. It is worth noting that Movavi Screen Capture Studio will also let you record video through a variety of other means that may prove helpful when creating a video. If you want you could record video from a webcam, import it from an HD camcorder, or digitize VHS tapes and TV tuners. As you can probably see Movavi Screen Capture Studio is far from ‘just’ a screen recorder. The features that it provides extend far beyond simply recording your screen, and will equip you with everything you need to create professional-looking videos or edit the footage according to any needs.